I racked up some impressive word counts and manuscript edits this week, submitted my contest entries (yes plural as in 2! if you count Nathan Bransford’s blog dealio), got in my third flash fiction challenge and all my blog posts, though my last was admittedly rather disturbing. I’m out of breath figuratively and literally. My only criticism about how I spent my time is my lack of attention to my NaNo novel, Sins, this week. Ellen’s tale got the lion’s share. I think it’s because I know I’m going to rewrite the last bits I just wrote to have my plucky Sins heroine brave some baddies on her own instead of with her protector. Time for her to stop being the victim and to take some ownership. Yeah! So, the usual: my stats are here. The Linky site where my compatriots are checking in is here. Great job juggling projects! Right now I’m focused on just one. I’m afraid if I move on to others, I’ll get bored with it and never finish it! It’s a fine line between having too many and too little projects for me. If I don’t have enough projects to rotate amongst, I’ll spin my wheels on the one or the few and end up redoing stuff. Too many and nothing gets finished. Oy! 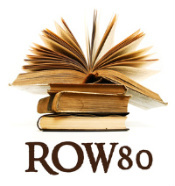 That’s what I like about row80. You’re free to modify your goals to fit what’s in your head that week. Congrats on the submissions and best wishes for next week! Wow, you rocked this week! Oh my, I do WISH I could catch them all but thank you for the kind words of encouragement. Huzzah! indeed my fellow Claire. And thanks for the well wishes and for dropping by. The encouragement means a lot. I’m having enough trouble getting one project done. Go you!